MTSS is a continuum of evidence based, system-wide practices to support a rapid response to academic and behavioral needs, with frequent data-based monitoring for instructional decision-making to empower each student to achieve to high standards. Response to Intervention (RtI) is a Multi-Tiered System of Support for academics whereas Positive Behavior Interventions & Supports (PBIS) is the equivalent for behavior. The mission of Saline Area Schools states: “We will equip all students with the knowledge, technological proficiency, and personal skills necessary to succeed in an increasingly complex society. Our ultimate goal is to instill in our students a desire for lifelong learning.” Our Multi-Tiered System of Support (MTSS) is built on a strong foundation of rigorous and differentiated academic instruction, and clear behavioral expectations for student success. 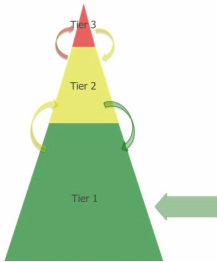 This tier 1 instruction sets the table for all students to reach a successful graduate learner profile. A student’s ability to feel a sense of achievement within themselves comes from a strong foundation in life skills and academics. 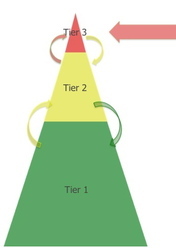 Tier 2, tier 3, EL and special education supports are layered into our educational system so that students achieve a sufficient level of literacy, math, and social-emotional proficiency in critical early years, setting the stage for short and long term success personally, educationally, and professionally. 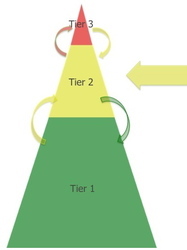 These layers of intervention compliment tier 1 by offering targeted supports in specific areas as soon as needs arise. ​Through collaborative problem-solving, positive communication, and maximizing resources of time, materials, and personnel, we hope to work as effectively as possible to ensure that all students leave SAS with a strong foundation, confidence, and desire for life-long learning.